How does your company decide how much floor space to rent? Can you say you use a scientific approach that helps you take full advantage of the tradeshow opportunity? Or is it based more on how much space you rented last year or how well business is going right now? The decision process you use can help or hinder your ultimate exhibiting results. Your exhibit plays many roles in the success of your exhibiting program. It supports branding, image, positioning and messaging objectives. But most importantly, it is the primary place for interacting with show attendees. Please remember that while branding, image, positioning and messaging are important elements of a successful exhibit program, your ultimate exhibiting results will come from the quantity and quality of face-to-face interactions you execute and the resulting actions that follow. Another thing to remember is that the size of your exhibit determines the number of staffers you can have on duty, and thereby controls the number of attendee interactions your exhibit staff can execute. The exhibit staffing rule of thumb is one staffer per fifty square feet of unoccupied exhibit space. So a 10’x10′ booth should have a maximum of two exhibit staffers on duty. A 20’x20′ might have up to eight staffers. Always be sure to consider the total amount of space, less exhibit properties, furnishings and displays. Please take a moment now to see if your exhibit is properly staffed. So what did you find? Is your exhibit under or over staffed? This is one part of the right sizing formula. The second part is about creating enough in-booth interaction capacity to take full advantage of the tradeshow opportunity. The rest of this article will present a step-by-step process to right size your exhibit for maximum productivity and profit. Step 1. Identify your Ideal Visitor Profile. Your Ideal Visitor Profile is a clear definition of who, out of all the show attendees, you want to visit your exhibit. It is usually a combination of a.) type of company or organization, b.) job function and/or title and c.) geography. Your Ideal Visitor Profile might also include the size of organization by number of employees or annual revenue. Finally, if available from the show organizer, it might also include product interest. To create your Ideal Visitor Profile simply look at your exhibitor prospectus and look at the show’s attendee registration form. This will tell you who is attending and what type of demographic information the show organizer captures from attendees. Step 2. Analyze show audience to determine the number of attendees matching your Ideal Visitor Profile. Share your Ideal Visitor Profile with your show account executive or exhibit sales person. Ask them to give you as accurate of a count as possible of the number of attendees matching the profile you shared with them. This count might be based on last year’s show attendance and/or this year’s attendee pre-registration data. Step 3. Calculate your current Exhibit Interaction Capacity. Exhibit Interaction Capacity is a formula successful exhibitors use to determine their capacity for face-to-face interaction in their exhibit. Here’s an example of how it’s calculated. Be sure to use your company and specific show information when doing these calculations! This tells you that if you utilize 100% of your exhibit interaction capacity you can execute 144 face-to-face, one-to-one interactions in your booth. Step 4. Contrast your current or planned Exhibit Interaction Capacity with the number of attendees matching your Ideal Visitor Profile. This is the critical step in determining if your exhibit is right sized. Your goal should be to create enough face-to-face interaction capacity to take full advantage of the tradeshow opportunity. This example tells you that if you utilize 100% of your current Exhibit Interaction Capacity, you can only handle 24% of the attendees matching your Ideal Visitor Profile. In other words, you do not have capacity to handle 76% of the attendees who do match your profile. Step 5. Right-size your exhibit to ultimately create interaction capacity for 45% of the attendees matching your Ideal Visitor Profile. Ultimately, you will want to create enough interaction capacity to handle 45% of the attendees who match your profile. Why? Because there is an exhibition industry benchmark developed by Exhibit Surveys called Exhibit Attraction Efficiency. In over 30 years of studies, Exhibit Surveys has found that the average exhibitor studied attracts 45% of their profile match to their exhibit. You can use this as a reliable performance benchmark. This example tells you that ideally, you should create enough interaction capacity to handle 270 attendees in your exhibit. So, how do we determine how to right size our exhibit? To be right-sized we need enough space and staff to accommodate 270 attendees versus 144. 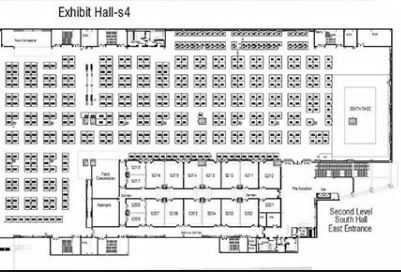 To accommodate this we will need four booth staffers versus two. And one additional 10’x10′ space to accommodate both our additional staff and the additional attendees. If the answer excites you and your team, then let’s move on to the financial side or the right sizing program. Step 6. Cost-justify your right-sizing program. Obviously, you are going to need to invest more financial and human resources to right-size your exhibit. And justifying the additional investment is important. So let’s take a quick look at the additional costs, along with a simple return on investment model. Here’s the formula for the Right-sizing Incremental Cost Estimate. Be sure to use your company and specific show information when doing these calculations! Possibly, Additional Exhibit Costs (talk to exhibit designer) ???? OK, so what does all of this mean? It means we have added one unit of floor space and two staffers along with the additional costs. We have created capacity to interact with 126 additional attendees. So, how are we going to get a return on this investment? Wow, an additional investment of only $6,000 gives us $69,096 or a 1151.6% soft dollar return investment? Now that’s what I call leverage! This entry was posted in Tradeshows and tagged New Exhibitors, Planning.